Cosmic Powers Unlimited was part of Marvels mid 90s line of Unlimited books alongside Spider-Man, X-Men, Fantastic Four &amp; 2099 Unlimited. Each book was published quarterly, was giant-sized and was published on better quality paper stock.Cosmic Powers Unlimited was an anthology series exclusively featuring Marvels Cosmic characters; each issue having a lead story then one or more shorter backups. 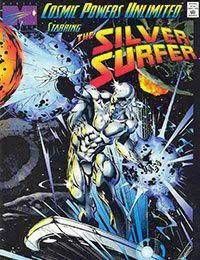 Each issues lead story featured either the Silver Surfer solo or the Surfer with Quasar and Beta Ray Bill as the Star Masters. Characters featured in backup features included: Jack of Hearts, Ganymede, Sundragon, Drax the Destroyer, Moondragon, Pip the Troll, Thanos, Captain Mar-Vell and Her / Kismet.Cosmic Powers Unlimited ran for a mere 5 issues.